No, fellow losties, it's no coincidence that this episode was called "LOCK" Down. For as we did see an actual lockdown in the Hatch, we coincidedly saw "LOCKE" go down in several ways. In the physical sense, we saw him trapped under the Blast door, and in the psychological sense we saw him DOWN on himself for having fear of abandonment. Yes, saw a whole new side to John Locke tonight. And we'll get to that in a bit. But let me get the routine comments out of the way first. "WOW!!!!!!!!!!!!!" God, does anyone love this show as much as me? I mean, I think I can find enjoyment in the worst episodes out there! (hello? Fire + Water? I'm talking about you!) But this was far from the worst episodes. 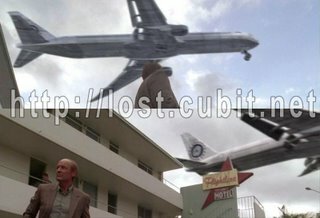 It may have been one of the most suspensful and fact revealing episodes to date in Lost. Yes, it may seem like we learned nothing tonight at first glance. But we learned a WHOLE BUNCH! And naturally, with every answered question, we opened up a few more in each of their places. The beauty of the writing strategy behind our favorite show. So, I have tons of goodies (some interesting, some ridiculous) to get into. And I'm sure some of you already researched and found them yourself. So let's just pass the ABC Recap link here and get underway! Okay first and foremost we finally saw how Helen (aka Peggy Bundy) leaves John Locke. This adds a bit more to the first flashback we see of Locke (in season 1) when he's talking to a person over the phone that he calls Helen (thought to be a "pay per minute type of lady that lets the crazy guy call her Helen"). John has got some serious abandonment issues that he's dealing with which may be what's leading him to look for more answers in life. Notice how when "HENRY" (if we can call him that) returns to the scene of the crime after "Supposedly" entering in the numbers; all that Locke cares about is that he didn't leave him. Can you blame him for having issues? His Dad used him for a Kidney and for transferring money to him so that he could start a new life after faking his death. And then when John tried to talk to the guy, he had an Oceanic Flight to catch. Yeah, the 2 planes that flew by were Oceanic flights. I doubt there is much significance...kinda like the stuffed Polar Bear that Michael bought for Walt in Michael's flashback this season. They just like to throw little stuff like that in our face. But what IS worth noting is the lady that Locke was talking to as he was doing his Home Inspector Job (Hmm, didn't he work for a Box Company prior to the crash?). Yep....you guessed it....it's Sayid's love of a lifetime - NADIA. And I think the key thing we found out in this exchange is that she is NOT married. Also, Locke's starting to bald more from his previous flashbacks. But he does look a LOT older on the island doesn't he? So when did all this stuff take place? I looked this one up, don't know the significance. When Helen sees Locke's Dad she asks "Are you Him?" remember this from anywhere? Yep, Desmond asked Locke the same question in the hatch. "Should I go get a ruler?" Good one Kate! Yes, the testosterone battle between Jack and Sawyer continued, but this time Jack had other things on his mind. And with his best poker face he hustled Sawyer out of the medical supplies. We did start to find out that Jack has been to some crazy locations in his life where he learned how to play poker, and may have gotten his crazy tatoo (which is Matthew Fox's tatoo that we were told would eventually play significance in Lost). Maybe someone can help me out and remind me where exactly Jack said he had been. All I remember is that Sawyer got a "burning sensation" from a visit to the hole of America, Tallahassee. All storylines tonight seemed to merge together by the end of the episode. 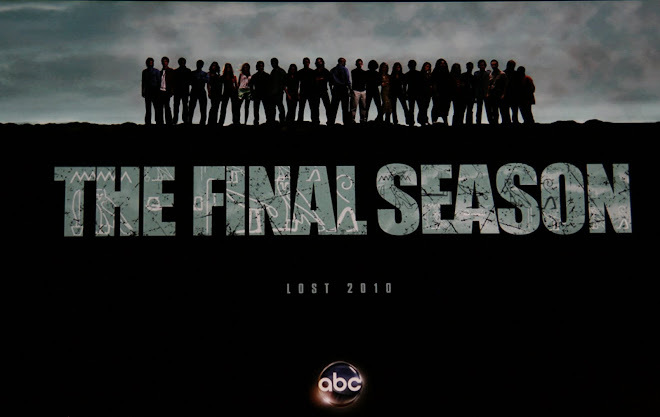 That being the Search party of Sayid, Charlie, and Ana Lucia; Jack running into Kate while heading back to the Hatch after this poker game; and the Locke/Henry antics in the hatch during the "LOCKDOWN" I know, this is the stuff that really has our heads spinning and that's why I saved it for the last subject. Let's see if we can make some sense of everything. So our resident prisoner "Henry Gale" made a last strategic move to get John Locke on his side prior to the truth being uncovered. Locke, with all of his abandonment issues, now seems to have a debt to Henry for not leaving him when he was stuck under the blast door. It'll be interesting to see how Locke reacts to the news that this guy isn't even "Henry Gale"
Okay, so the blast doors closed in the hatch. Why on earth did that happen? There was a countdown that came on the speakers and then BOOM....Locke was "LOCKED" in the hatch. Naturally, his first concern was getting to the numbers. Which got him into the predicament of getting his legs crushed. Ever notice how scared Locke gets when he fears not being able to get to the computer to enter the numbers? It's almost like he's scared of upsetting the powers that be. He believes that more answers will come if he keeps pushing that button. That is HIS job until he is told otherwise. I've talked to some and heard on P&S this morning that perhaps the LOCKDOWN procedure was to lock the Hatch residents in the Hatch as Supplies were dropped off. Maybe so they couldn't see "HOW" the supplies were dropped off? All we saw was a parachute and a bunch of Dharma food and a Beacon. Was this really a food drop-off from a plane? I just don't think we have enough information. But the closing of the blast doors seems to be an independent function from the entering of the numbers and it seemed to coincide with this food showing up. 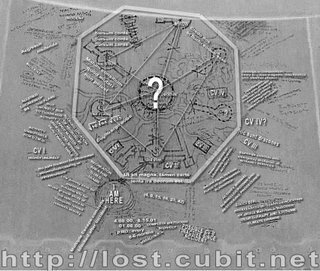 Another mystery is if Henry even entered the numbers which led to the blacklight display of the Bunkers on the Island. Maybe this was just "The Others" messing with Locke one more time to give him one more vision. 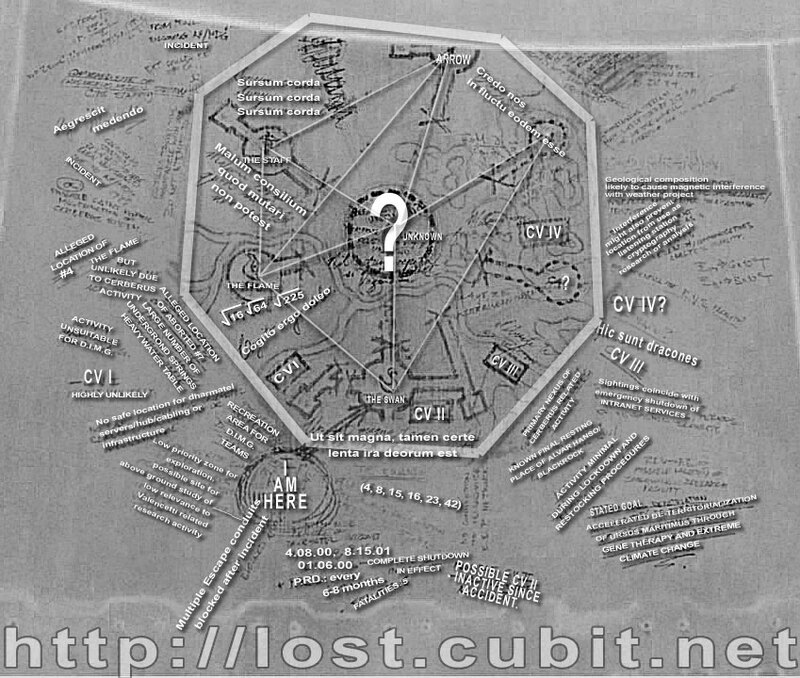 Or...based on the information on the Map....maybe Desmond wrote this up after years of investigating the island and punching in the numbers? He couldn't have wandered too far to learn about the other hatches if he had to punch in #'s every 108 minutes. Malum consilium quod mutari non potest - It's a bad plan that can't be changed. Just remembered, notice how Fake Henry knew the numbers very quickly when Locke told them to him. I really don't think "Fake Henry" had enough time to climb through the grate and punch the numbers into that computer. I think he did something else instead that activated the blacklight map. This would indicate that nothing happens with the clock runs to 0. But who knows? So besides all the Map craziness we also finally found house about "Henry Gale." His aliby almost checked out (they found the Smiley Face Balloon and a Grave), but detail oriented Sayid dug up his "wife's" grave and found the REAL HENRY GALE buried there. Note that his address is "815" Walnut Ridge and that his zip code adds up to 23. 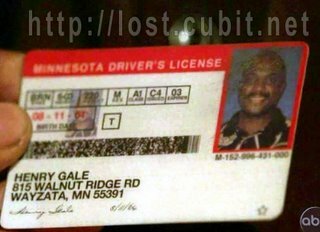 And btw...I was a big dork and looked up the address on Google Maps...doesn't exist, but the TOWN Does...and in that town there is a GALE Road! What does this mean? I'm going to guess ABSOLUTELY NOTHING! Okay, I've gone nuts with the details this week and did so much theorizing that probably none of this makes sense. But cut me some slack...this took me a lot of time! lol. We're inching closer and closer to that Season Finale and bringing the conflict with "The Others" to a whole new plateau of significance. And this episode did a fantastic job of continuing to set that stage. Looks like next week will be a new episode again. Not sure if you read the comments on the previous Blog but I noted the Season Finale will be May 24th. Based on this information, we can probably assume we'll have 2 more weeks of reruns between now and the finale. Let's go ahead and guess that they're going to happen April 12th and 19th! We'll know soon enough! Have a good rest of your day. And please post comments on any theories or facts you've uncovered! April 12th will definitely be one of the reruns....they were promoting a 2 hour Alias event for that night. Great recap! I can't wait for next week! Since you asked, Sawyer learned to play poker in Phuket, Thailand. Oops, I meant JACK learned to play poker in Thailand, not Sawyer. Also...some of the hatches are outlined in dotted lines. Does this signify that they're contaminated? These may be the power supplies (constant voltage power supply) for the different stations. Did the bunker where the tail plane people were have power? 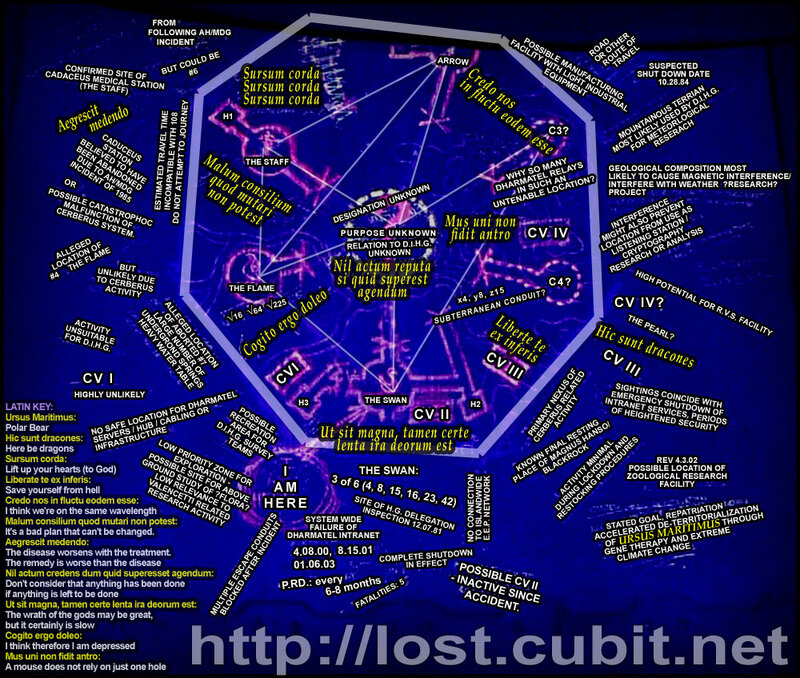 Maybe that station was on CV II, which on the map says "possible CV II inactive since accident". CV could also stand for containment vessel, or reaction vessel, which is a large steel container that houses the reactor core, control rods, moderator and coolant, and other control systems to maintain safe operation of the reactor. The whole map kinda looks like a particle accelerator - maybe a circular one like FERMI? I wish I knew what the 1985 accident was that's referred to on the map! This island definitely has some fission/fusion experimentation history, hence "heavy water table" on the map. "PRD every 6-8 months" on the map probably means period ration drop. Was it coincidence that the button had to be pressed at the exact time when nobody could get to the computer? Maybe the ration drop was timed to coincide w/ someone NOT pressing the button, allowing the magnetic field to temporarily go down so the supply plane could fly over without crashing. wow, that's a crazy amount of detail! Thanks for the insight! Good point with the PRD and it coinciding with the computer alarm going off. My only question would be then why Desmond wouldn't know that nothing catostrophic would happen if the clock ran out (assuming that he's experienced a PRD before)? You know...since he got all scared and ran from the Hatch when the clock was counting down. Then again, we still don't know what Desmond's true intentions there were. He may have been planted there by Dharma and/or THE OTHERS to establish fear amongst the survivors of NOT pressing the button. Yeah....definitely love the attention to details on this show! It's fantastic. 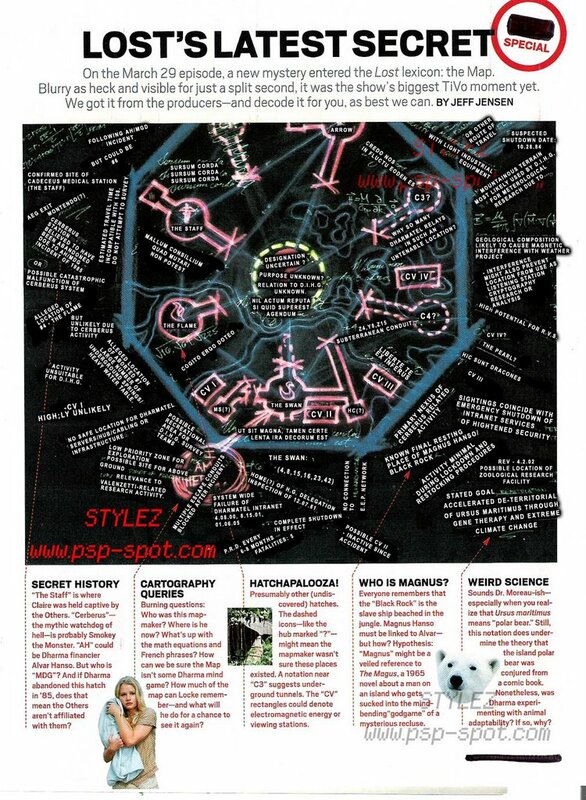 here's another good picture of the map (with descriptions on the outside of the picture for the text. thanks brendan! 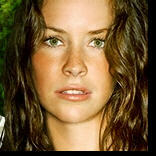 I'm just watching lost for the 1st time, and I love your blog. This was one of the most exciting episode. Thanks for all the map pictures, that's why I cam here. 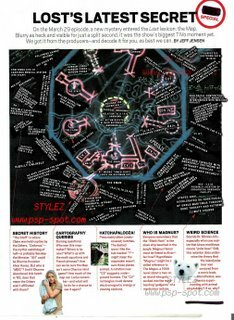 While binge-watching Lost for the first time on Netflix, I discovered this great blog while googling for an image of the map that appeared in this ep. Glad I found this place because I caught up on all the previous recaps and will be checking in again after every episode. 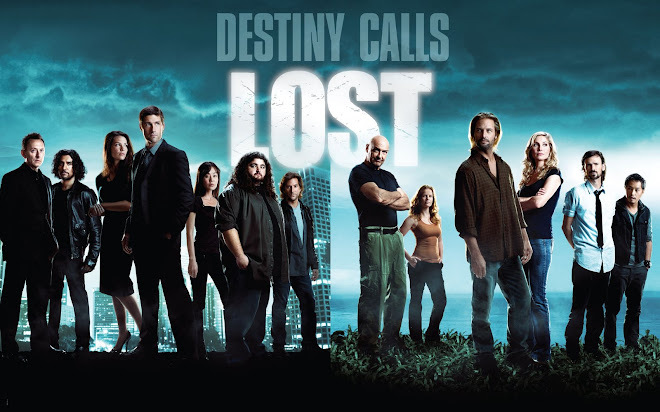 When Lost first aired, I had two young kids and didn't watch the show at all. I also avoided most of the internet chat, media coverage and enormous hype about the show because I knew, someday, I would get the chance to watch the entire series as a newbie. (I'm also avoiding The Sopranos for the same reasons.) For Lost, that day has finally arrived! Mike's Lost blog, unlike many others, does a good job of avoiding spoilers for future eps, and any of my comments will do the same because I haven't seen any of the future eps. It also means that any speculation or theories I might postulate here will be same as anyone who commented over seven years ago; utterly unaware of what's about to happen. I have become a huge fan of the show during the first 40+ episodes and look forward to reliving what you all experienced the first time around! Wow...no Sopranos yet either? You have a lot of great TV ahead of you! But, I'm jealous that you're experiencing LOST for the first time now. It gets better with every viewing, but still the initial shock and awe of the episodes was fantastic! Glad you're enjoying the blog...I'll catch up with you down the road!